Thank you all for your kind thoughts for my Mum - she's now out of hospital, and despite the bad break and major surgery, is getting around quite well by herself with the aid of a frame! Much of my time was spent driving between her cottage and Cork (where she was in hospital) which is an hour at least each way (which is kinda bonkers as I haven't driven in 4 1/2 yrs...) and rearranging furniture and sorting paperwork and generally getting her cottage ready for her. I spent the first couple of nights with Carol Feller & family, and I can't thank them enough for putting up with me & helping me out. Mum's coming on leaps and bounds with physio - she's fit and able and stubbornly independent and if anything, we'll be telling her to slow down. Everything is on her side, and although she'll be reliant on crutches for many months to come, she'll be back on her feet quicker than expected after such a nasty break. I hope to be back again in a few weeks, and will talk more about that another time, but right now I'm keen to publish a new (free!) pattern that's been waiting in the wings. It was ready to go before I left but wanted to wait until I was back in the land of internet, just incase any problems or queries popped up. Spring is in the air (I came back to no snow! and warm sunshine! w00t!) and what better than a fun Hat to get us all in the mood? Rainbowret was designed and knit for my sister-in-law as a (belated) xmas pressie. Rainbow is her name (tho' she might not thank me for posting that) so what better Hat than this? The pattern is free, and 6 sizes are included, and it's provided in written format only. The I-cord finish at the crown is optional, though I do think it finishes it off nicely. The Hat pattern itself is incredibly simple; what makes this one special is how the yarns are used, how they're prepared and how you work out your colour sequence. 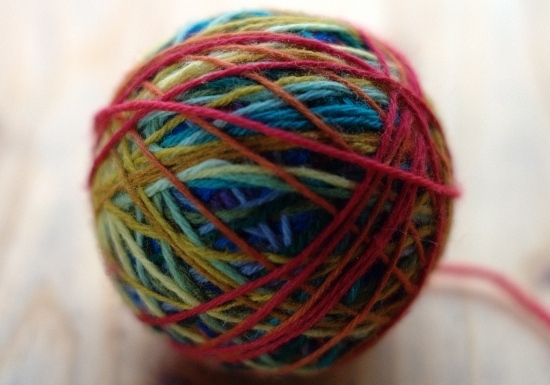 Essentially, the Rainbow Ball uses the spit splice method to join the yarns, and I've written a whole tutorial especially for the Rainbow Ball, which can be found within the Tutorials section of this site. I've published the tutorial and pattern separately, as I figured it might be fun to apply the Rainbow Ball method to other small knitting projects, besides Hats. You could use the method for a simple beanie and matching gloves and much more besides. Or folks may wish for a simple beret pattern without the rainbow effect, and Rainbowret would be perfect for that. I also considered making this a paid-for pattern, but that would have meant making the design much more technical, to include, amongst other things, exact yarn requirements, which not only would be pretty tricky to do with yarn oddments (unless I used a single commercial yarn all the way through) but would also take the fun out of it. This design is all about playing with colour, experiementing with your oddments, and published this way, you can do just that! A guide based on the yarns I used for yardage etc is included, so you do have a jumping off point. So, there you have Rainbowret! It's fun and bright and cheery and provides another perspective to yarns and Hat knitting.